If left unchecked, however, the DPP’s position on Taiwan’s independence – which is written into the party’s founding constitution and is part of its national narrative – has the potential to exacerbate security tensions in the Taiwan Strait. While any military scenario has been well simulated on both sides of the Pacific, the adverse implications for China-U.S. relations leave no space for military opportunism, even if one side predicts tactical victory. Memories from 1996 – when Chinese missile tests in the strait prompted U.S. President Bill Clinton to order two fully armed carrier battle groups to pass through the Taiwan Strait – have shaped the strategic operational codes of the Chinese military and the Central Politburo. While China might have had the military resources to sink U.S. naval forces in its close periphery (quantity has a quality of its own) the strategic escalation that an attack against a U.S. carrier would trigger led Beijing to de-escalate. Since the importance of Taiwan’s reunification with the mainland remains an indispensible argument in CPC’s rhetoric on the rejuvenation of the Chinese nation, China’s officials have long strategized about how to neutralize strategic U.S. superiority in the event of a new strait crisis. The 2008 acquisition of an old Soviet aircraft carrier from Ukraine should be seen in this context. This carrier is the missing piece in China’s strategic puzzle in its first island chain and adds new strategic variables to a Sino-U.S. clash over Taiwan. While China’s 20-year-old aircraft carrier has been ridiculed as an outdated vessel that would easily succumb to U.S. technological and tactical superiority, its significance is not tactical or operational, but rather strategic. As a respected Chinese professor argued in Tsinghua’s “Beyond Geopolitics Summit” in 2013, the presence of the Chinese carrier would equalize the strategic balance between the two powers in the Taiwanese strait. Xin Qiang notes that it is strategic suicide for a nuclear power to attack the aircraft carrier of another nuclear power and obliterate 5,000 elite pilots, engineers, officers and navy men. As Professor Robert Pape put it, such an attack would lead to “predictable unpredictability,” with a much greater risk of the crisis escalating to a limited tactical nuclear war and, ultimately, to a nuclear holocaust. The destruction of a carrier would trigger a chain reaction and military escalation that neither side could control. According to Pape and Qiang, for this reason alone rational nuclear powers would not even dare to engage in a prolonged face-off of aircraft carriers and would instead seek to deescalate a nautical crisis. In the 1996 crisis, the U.S. “carrier monopoly” neutralized the Chinese tactical advantage over Taiwan by highlighting the U.S. strategic dominance. China’s leadership saw the potential destruction that an attack against U.S. carriers would unleash. However, in a renewed Taiwanese crisis today, China could pass the ball to the U.S. side. Its single carrier has delivered strategic risk parity in the straits. As the Chinese carrier would face-off against the U.S. carriers, a war of nerves would begin. The longer the confrontation and the maneuvering, the greater the possibility for a mistake that would lead to a strike on a carrier with perhaps irreversible consequences for the relationship between the two superpowers and for world stability. As China would enjoy the advantage of playing on its own doorstep with Chinese public opinion fiercely opposing any retreat, and is it would be willing to dance with the U.S. closer to the edge, the U.S. would have to deescalate and take the conflict to the UN or risk a nuclear confrontation. Thus the “predictable unpredictability” of escalation and Mutually Assured Destruction ensures, according to experts, that a U.S.-China aircraft carrier face-off would not be a prolonged confrontation and, most importantly, that it would end peacefully as both sides’ rational strategy would follow the norms of nuclear deterrence. However, as Donald Kagan – one of Yale’s most distinguished professors – once put it, miscalculations and irrational decisions have been the norm in history, as old hatreds and wounded honor inspire dangerous and irrational actions. 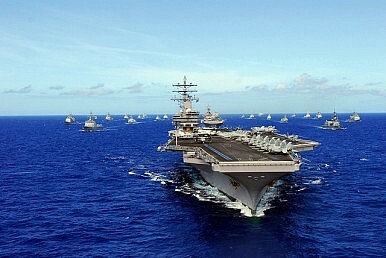 Even though experts and war simulation models confirm that a potential aircraft carrier face-off would end peacefully, Kagan’s observation stands as a clear reminder that preempting a clash by dialogue and demilitarizing a conflict zone is the safest and perhaps the sole path for sustained peace. After all, even a U.S. strategic retreat in case of a cross-strait crisis would leave an irreversible mark on the China-U.S. relationship, increase U.S. embitterment against China, encouraging militarization and an ever accelerating arms race. In their post-1991 engagement, China and the United States have shown that their commitment to a peaceful resolution of disputes remains at the forefront of their strategic relationship. From the 1996 strait crisis to the accidental bombing of the Chinese embassy in Belgrade in 1999 to the 2001 U.S. spy plane collision, the U.S. and China have been optimistic about each other’s intentions and mutually de-escalated dangerous confrontations. A DPP government in Taiwan, with an assertive political agenda promoting a distinct Taiwanese identity and de jure independence, would unquestionably test Sino-U.S. relations. Beijing and Washington should preempt any possible cross-strait military buildup and engage in a sincere dialogue about Taiwan’s democratic future. A clash of carriers would be a risk that the world cannot afford to take. As Stephen Hadley, a former U.S. national security advisor, once noted, in the most pivotal relationship for peace in our time – the US-China Relationship – seeing the glass half full instead of half empty is an important forma mentis in crisis management. The U.S. and China have shown in their communiqués that the glass over the question of Taiwan is half full and thus the solution should be political and not military. Managing renewed cross-strait tensions peacefully will be another significant brick in constructing a “new major powers” relationship and promoting long-term global prosperity. An earlier version of the article was appeared at the China-US Focus – the journal of the China-United States Exchange Foundation. Vasilis Trigkas (@willtrigas) is a visiting research fellow at the institute for Sino-EU relations at Tsinghua University & a non-resident WSD Handa fellow at Pacific Forum CSIS. He is also an advisor to the president of the Hellenic Foundation for Culture and a researcher at www.thinkinchina.asia – the leading community of young China experts in Beijing.